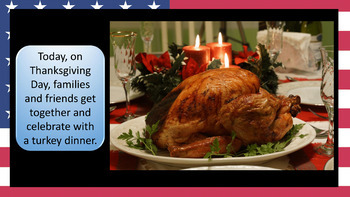 This resource contains a fully editable and informative 45-slide PowerPoint presentation on Thanksgiving Day and an accompanying 33-question interactive PowerPoint quiz. A slightly shorter, simple text, version of this presentation, more appropriate for younger / Special Education students, is also available. 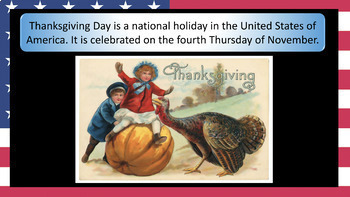 On what day is Thanksgiving Day? Which King of England tried to make everyone follow the Church of England religion? You may also be interested in the Thanksgiving Day presentation that accompanies this quiz and contains all the information need to answer the questions in the quiz. The PowerPoint contains hyperlinks to the Thanksgiving Parade in New York, President Obama's final turkey pardoning and a short video on the history of Thanksgiving Day.